"View From The High Banks, Below Middle Falls"
Genesee River Scenery, Portage, N. Y. This interesting view shows the same general area as Image 98. Unlike the other image, it appears to have been taken from a point on the eastern bank of the gorge, looking downstream. The light area at the top of the cliff, right of center, is the result of the bank being cut back when the Genesee Valley Canal was constructed. 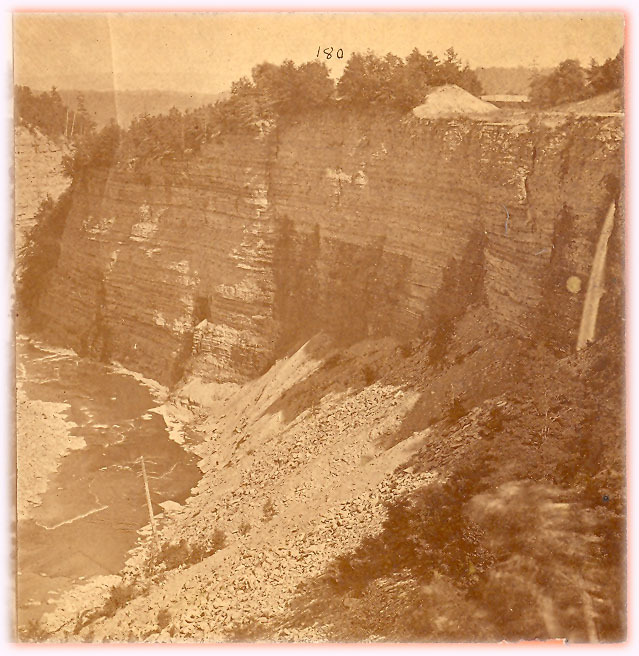 It was from this point to a spot near the Middle Falls that a shelf was blasted in the cliff which allowed the Canal to be run high above the Genesee River whose waters are visible in the stereoview at the bottom of the cliff. Image 110 shows the how the canal was "pinned" to the cliff south of this point. The talus seen in the foreground is from this project. The waterfall in the far right of the image was a waste weir for the Genesee Valley Canal. The Canal and towpath are visible as the flat area at the top of the cliff in the upper right. In the larger image below, if you follow the line of the canal away from the photographer, you will see what appears to be a bridge over the Canal. A bridge at that location is indicated on both the 1858 and 1872 map of Portage. A decade earlier a Civil War training camp operated just to the east (right) of this location.